These little morsels of deliciousness contain very little processed sugar, no flour, no butter, no cream, no eggs and there is no baking involved. Yet they still taste sooo good and will be perfect Valentine’s Gifts, Easter Gifts or just make them as a treat for yourself. I have healthified them as much as I can (<<I’ve invented a new word! – It is not in the English dictionary, so I am claiming it as my own invention! hehe). But you can be free to change them up as much as you like. If you would rather use milk chocolate, go ahead! If you would rather not use nuts, take them out! If you would rather use strawberries instead of raspberries, go ahead! See….you can change them how ever you wish, to make them what you want to devour. Using a selection of Lindt chocolate, I have created some really yummy Truffles that I want to share with you guys. This isn’t sponsored or affiliated. When I was in Tesco these were the chocolate that caught my eye and I couldn’t wait to try them. Break up the chocolate and put in a glass bowl over a pan of simmering water. Once melted take off the heat and put aside. Mix the melted coconut oil and desiccated coconut together in a bowl. Take a single date, carefully open it on one side and spoon in a small amount of the coconut mix, until centre of the date is filled, then close it up. OPTIONAL – Sprinkle the tops with some extra desiccated coconut to decorate. Pop in to the fridge for 20 minutes to set and then enjoy. Store in an air tight container in the fridge. BONUS TREAT! – I had some coconut mix and melted chocolate left over so I mixed them both together and made some minty coconut chocolate cups. I spooned the mix in to some mini cupcake cases and then put them in the fridge to set. Once set, I took them out of the cases and turned them upside down. Voila! !…another edible delight. Melt the chocolate in a glass bowl over a pan of simmering water. Once melted put aside. Take a single date, open carefully and put a raspberry inside and close up again. If raspberries are on the larger size, like mine, cut them in half and put half inside the date. Dip the stuffed dates in the melted chocolate and lay on the baking tray. So there you are. Above are 4 super tasty chocolate treats that won’t bring on the guilt. Whether you keep them for yourself or give them as gifts, one thing is for sure, they will not last long! I’d love to know what you think? which one will you be making? Tweet me @JustCallMeLynz or come over and comment on my Instagram or Facebook Page. Salted Caramel Snicker Bars – Healthyfied! Lots of love to you all for now. Thanks for your support! Previous DIY Card Organiser – I finally did it! Next Dear Lady in the Car Park…. I do like dates. This is a great way to like them even more. I’m very interested to try these recipes out on my family and see if I can get some healthy in them! I know the strawberries would pass and my youngest could even help stuff it. Thank you for sharing! These are the perfect DIY gifts for Valentine’s Day! I’m not sure if I like dates or not, I’ve never really had them. I’m sure I’d like them if I tried them. I want to try the peanut butter raspberry filling really bad. I can’t wait to try these! Wow, I never knew this can be as easy as one, two, three. I love lindt and this is a must try. A unique way to add a new taste on the chocolates. These are so cute and I love how easy they are – especially the no-bake part! 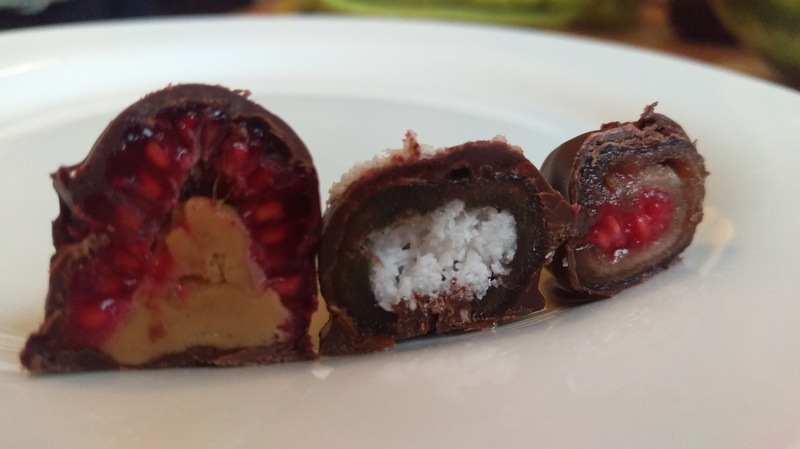 I like the ones with the peanut stuffed raspberries – I might have to try a similar treat but with hollowed strawberries. I’m drooling over these treats. I should definitely try to make these treats on Valentines day. Thanks for the idea. Reblogged this on cork web support.